Hello! It's time for another Mojo Monday sketch (#284)! Today's fabulous sketch is brought to us by Julee. To say that I went a little "star crazy" is an understatement. :) I used some new Verve today to make a 6x4 card for my Project Life album. The sentiment is from Shining Star. I also added a pink polka dot star that was created using the Starry Die. Accessories: A Cut Above Dies: Starry Die (Verve), Stars embossing folder (Provo Craft), Markers (Copic), Seam binding from Spring Fling Ribbon Collection, Hemp cord, Foam tape, Thread, Sewing machine. Loving this, Stephanie!! The star on all layers is fabulous!! Just darling, Steph! Love that little star on the twine bow. That's such a fab take on the sketch, Steph! Love the embossing with those papers! 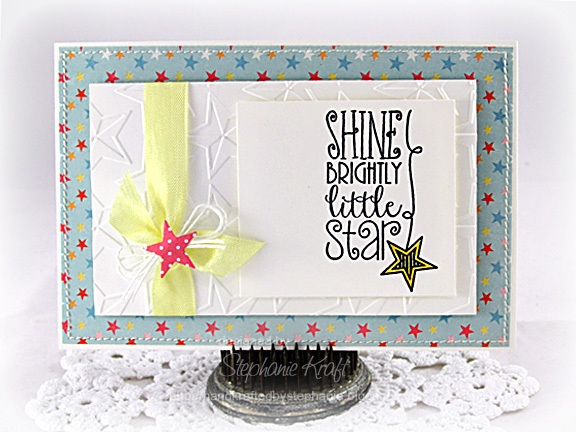 Just gorgeous - love the way the paper matches the sweet sentiment and die cut star too! Fab! Love this! So very sweet! Beautiful title card and am loving all that white space! I had forgotten about my star EF, so thanks for the inspiration! What a lovely starry take on the sketch! I have that same star embossing folder and I really love it. Thanks for the beautiful inspiration. Soo CUTE Stephanie!! 8-) I am Soo Loving all the stars! Especially the cute little pink polkadot embellie you created! soooo, so cute! love the embossed star background.